Charles Darwin’s readership largely consisted of other well-educated Victorian men, nonetheless, some women did read, review, and respond to Darwin’s work. One of these women was Darwin’s own niece, Frances Julia Wedgwood, known in the family as “Snow”. Snow was the daughter of Emma Darwin’s brother, Josiah Wedgwood. She was considered the cleverest of her generation in the impressively intellectual Wedgwood and Darwin family circles. 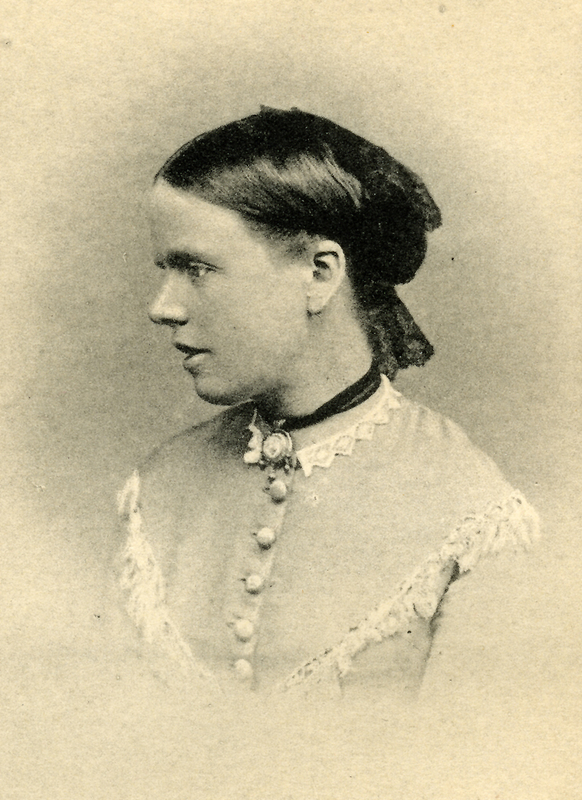 Through her family she was well connected to many academic and literary luminaries of the day including Thomas H. Huxley, Elizabeth Gaskell, Ruskin, as well as James Martineau and Thomas Erskine. Deeply interested in the reconciliation between an intellectual Christianity and Darwinism, Julia worked for 22 years on a volume titled Moral Ideal: a Historic Study, a history of the evolution of ethics in the great world civilizations, from antiquity down to Victorian scientific positivism and theological modernism. At the zenith of her reputation Julia Wedgwood was a considered one of the great female intellects, beneath only George Eliot, as far as her ability to handle ‘masculine subjects’ and modern topics. However, her work was impeded by the expectations placed on her as a maiden aunt in a large family circle, and she spent much of her adult life caring for relatives’ children, and ailing elderly relatives. Towards the end of her life Julia Wedgwood regretted that she had not had the opportunity to attend university as many of the younger generation, and lamented that she might have made so much more of her life, and her work has been largely forgotten to the present day. Snow had a particularly notable exchange with Darwin over a review she wrote of Origin in July of 1861 for Macmillan’s Magazine. Deeply interested in reconciling Darwin’s newly published theories with the tenets of Christianity, Julia structured her review as a dialogue between the religiously orthodox “Philocalos” and the defender of Darwinism “Philalethes.” Importantly, Wedgwood’s review suggests that natural selection is not inherently at odds with Creation. The crux of Wedgwood’s argument is that natural selection provides an explanation of the origin of species but says nothing of the origin of life. Therefore, Creation is upheld as the means by which life came to be and natural selection is upheld as the means by which God’s creatures reach his ultimate goal. Darwin praised Julia’s Macmillan’s review, in particular lauding her comprehension of Origin. The principle of natural selection is the answer to the question, How were these forms perfected? It throws no light on the question, Whence do they originally spring? Although Wedgwood was an accomplished thinker and writer, her scholarly career was impeded by the societal expectations placed on her as a maiden aunt in a large family circle. As a result of her familial position, Wedgwood spent much of her adult life caring for relatives’ children and ailing elderly relatives. [Wedgwood, Frances Julia]. 1860–1. The boundaries of science, a dialogue. Macmillan’s Magazine 2 (1860): 134–8; 4 (1861): 237-47. Wedgwood Barbara and Hensleigh Wedgwood. 1980. The Wedgwood Circle, 1730-1897. Studio vista. London. Novelist, biographer, historian, and literary critic. Daughter of Hensleigh and Frances Emma Elizabeth Wedgwood. Published two novels in her mid-twenties, one under the pseudonym Florence Dawson. Wrote book reviews and an article on the theological significance of Origin. Conducted an intense friendship with Robert Browning between 1863 and 1870. Published a study of John Wesley (1870), and helped CD with translations of Linnaeus in the 1870s. Published The moral ideal: a historical study (1888). Active in the anti-vivisection movement.